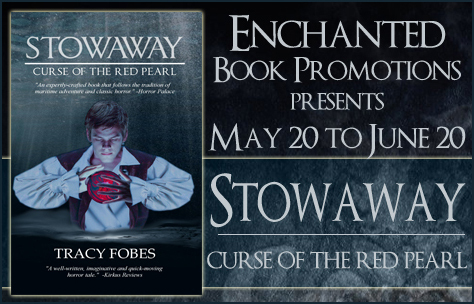 We’re scheduling a blog tour for horror / thriller “Stowaway: Curse of the Red Pearl”. The tour runs from May 20 to June 20. We’re setting up book reviews, book excerpt posts, character interviews and a tour-wide giveaway for a paperback copy of the book. We have .pdf, .epub and .mobi copies for reviewers. CLICK HERE and fill out Enchanted Book Promotion’s CONTACT FORM if you’d like to host this tour, what type of tour stop you’d like to host and what dates work for you. Or, leave a note in this post’s comment. Don’t worry if you haven’t hosted before…just mention it either on the contact form or in the comments to this post and Majanka will get you set up.